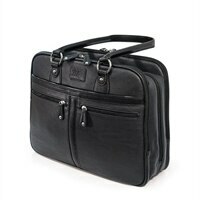 Mobile Edge Verona Notebook carrying case - 16" - BlackThe Verona is the ideal combination of fashion-inspired styling and real world functionality. This versatile tote functions well as a briefcase, laptop bag, purse and a travel bag and accommodates laptops up to 16-inch. The stylish Verona is crafted from durable Vegan-leather with contrasting trim, polished nickel fittings and a Tartan cotton-twill lining. The dual drop handles are flattened where they rest on your shoulder which makes a loaded bag much more comfortable to carry. The Verona features three compartments with top zipper closures; one with padded poly-fur lined pockets for both your laptop and tablet, a second for file folders, documents or work papers, and a third for peripherals or travel accessories. Five zippered pockets provide secure storage for personal items. The integrated organizer features pockets for a smartphone, flash drives, memory cards, pens, lipstick and business cards. Convenient exterior pockets on the front and back allow easy access to items you need quickly. When you combine the great styling, laptop and tablet protection, storage and organization features and user comfort, the Verona is the perfect case for business women on the go! The Verona is the ideal combination of fashion-inspired styling and real world functionality. This versatile tote functions well as a briefcase, laptop bag, purse and a travel bag and accommodates laptops up to 16-inch. The stylish Verona is crafted from durable Vegan-leather with contrasting trim, polished nickel fittings and a Tartan cotton-twill lining. The dual drop handles are flattened where they rest on your shoulder which makes a loaded bag much more comfortable to carry.